Sunny with a side of light and airy? If that’s in your décor forecast, you’ve come to the right place. The right combinations of colors (and lack of them), lightweight materials, lighting, rugs and accessories can create that oh-so-simple yet comfortable aesthetic you’re seeing on social media – and wanting for your own home. Follow these simple steps and create a wish list as you go. 1. Paint clean and light colors. Light doesn’t have to mean “white”, but you really can’t go wrong with it in any room. It creates the canvas or backdrop for everything else in your room. If you’re not completely sold on white, try a whisper of green, blue, yellow, or even lavender. Pale neutrals will set the mood too. Showcase a few pieces of artwork for the walls and frame them simply; artwork should be large enough to hold their own on the wall yet not be overwhelming. 2. Add a dash of bright color. 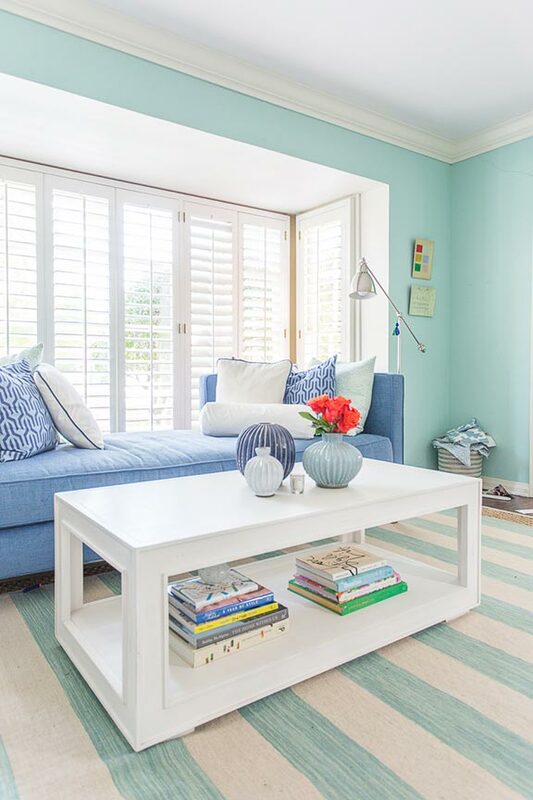 Apply the 90/10 rule: use 90 percent white (or whichever light color you’ve chosen) throughout your room and add a dash (10 percent) of a bright and happy color. (Greens or blues, anyone?) Whatever you do, go with your gut. You can always rely on stately black accents too for turning up the level of sophistication. We aren’t all lucky enough to have skylights, or bay windows, or even big windows for that matter, but make the most of what you have. Banish the bummer heavy drapes and opt for cheery sheers instead. Need more coverage at nighttime? Plantation shutters offer the best of both worlds with just a nudge on the tilt rod. A chandelier or wicker ceiling fan or even just white ceiling fan blades. 4. Delight in lighter fabrics and furnishings. 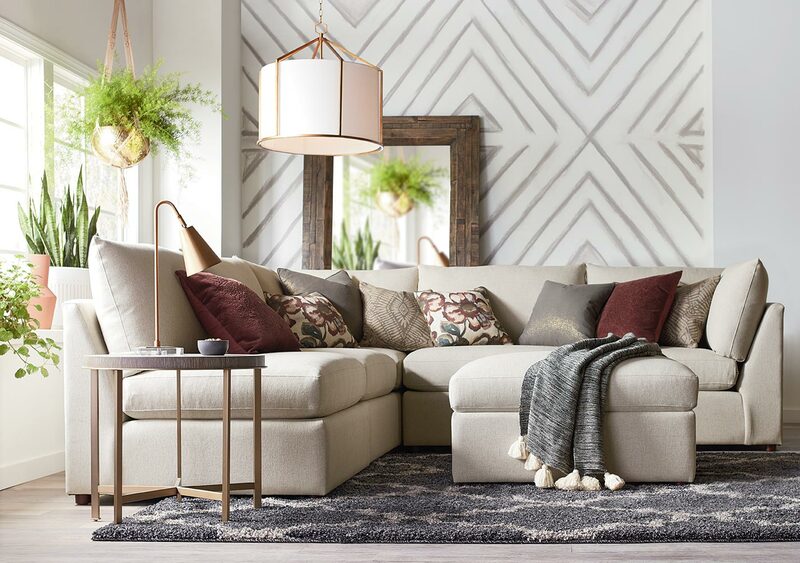 Dark, thick fabrics (and leathers) need to exit stage left now to make way for the stylish Beckham and versatile Exeter sofa and sectionals in light-colored or muted patterns. Bookshelves can take on a more modern, artsy look by removing volumes and artfully placing a few personal objects d’art. Generously scaled Pippa accent chair and ottoman have light-hearted spool style legs. For a cocktail table, console or media console, warm and charming Bluffton is the way to go. In the bedroom, you can lighten up heavy looking furniture like the bed simply by removing the footboard to add more openness to the room; likewise, choose tall, narrow pieces of furniture (think Bella Collection) over wider pieces to give the appearance of extra roominess. Light-colored woods and painted furniture (again, think Bella Collection) have a much-coveted vintage market look. There’s a bookcase, writing desk, buffet and lots more. Neo-traditional with a modern twist, Ventura bedroom pieces combine crisp finishes with handsome accent details. What kind of flooring do you have? White or some kind of light-colored flooring or carpeting is ideal, while hardwoods of any color will provide that much-needed organic feel. An area rug like Dunmore and Kindred can serve to lighten up the room too, as well as a textured or patterned rug if you choose. Speaking of organic, by all means go au naturel. Touches of green and anything living will ground your room with a modern earthiness. A potted plant will work wonders. 7. Eliminate clutter and mess. At all costs, declutter your room and unravel that mess. Kill the knickknacks. Show only the pieces that are useful, or that you just adore. Nothing says “zen” like a carefully placed storage basket keeping all the loose ends at bay. Shop online now or visit the nearest store. Book an appointment with a professional Design Consultant who can help you get your head in the clouds, free of charge.